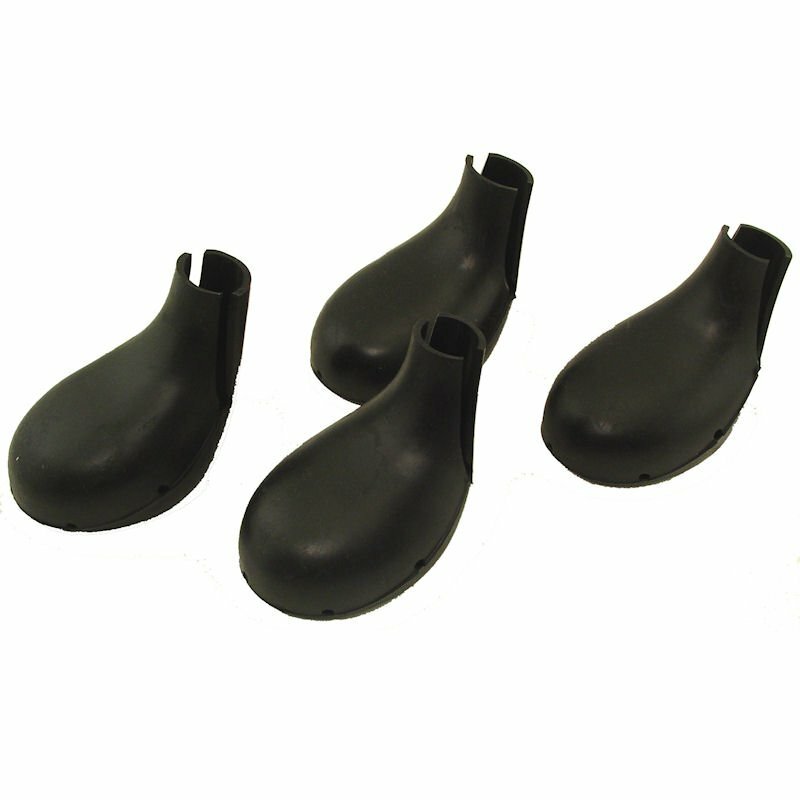 Lewis Vented Rubber Dog Boots -- Set of 4. $42.95. Steve taping up Lewis dog boots on Patch in West TX. "These boots turned my dog from a 1/2 day dog, to a full day dog." I ordered the Lewis boots in size large after measuring my labs feet. When they arrived, they looked a little small, but fit great. The presentation of the boots is quite impressive. They come in a very nice carrying bag with great written instructions. They are made of a high quality rubber that feels like it will last many seasons. It took about 10 minutes to put them on. And my dog was use to them in about 5 minutes. These boots turned my dog from a 1/2 day dog, to a full day dog. I primarily chukar hunt, and the rocks and shale tear my dogs pads to the point of immobility. The first time out with the lewis boots, he went all day and was ready for more. It is important to install correctly. It would be a bummer to have your dog lose one of these great boots. "Some dogs wear them just like the instructions say. Some dogs need baby socks or strategically place Moleskin." I have used these for 35 years. If you come to Arizona, don't come without Lewis Dog Boots. Learn how to put them on to suit your dog. Some dogs wear them just like the instructions say. Some dogs need baby socks or strategically place Moleskin. In Arizona, dogs acting tired early usually I only have sore feet. These boots are a new dog in a bag. Love these boots. After the initial high step when the boots were first put on, he loves running in them. No cactus in his paws, and no bloody pads over rocks. Strongly suggest you watch the video where they use duct tape to put on the boots. I know that sounds strange, but it is sheer genius. They work good. We hunt in stickers. "Worked really well. Kept the grass burrs out." Worked really well. Kept the grass burrs out. She hunted all day long. "Best protection for AT through hike." Best protection for AT through hike. Always used Lewis dog boots. Somewhat hard to put on dog, but offers the best protection possible. Great product. "Lewis boots are the best I have ever used." I have purchased bird dog and hunting supplies from GDS over the past twenty years. Previously, I bought from Dunn's Supply. Great products and support from GDS. On to the Lewis Boots. They are made in Enid, OK, just 50 miles from where I live. I have used the Lewis and other boots for the past 40- 50 years. Lewis boots are the best I have ever used. They are tough and there are few thorns that will penetrate them. I have tried many types of boots. The cordura boots are pretty easy to install. The one knock on them is that they wear out quickly (dependent on terrain), and the dogs will lose a boot even if you tape them. Also the cordura is more likely to allow thorn penetration than the Lewis boots, which are made of tire grade rubber. For me, the Lewis boots have held up from Western Oklahoma, Montana, Arizona and several other places. Equally important is to properly size and install the boot. I found the Lewis sizing guide to be very reliable. It is important to keep the dogs nails reasonably trimmed. A Dremel tool with a sanding drum is a great way to do this. Over the years I have tried many installation methods. One common problem has been in applying the base coat of tape on the dog's skin/hair. I have used many different types of tape, both surgical and athletic. When you remove the boot after a day's hunt, the tape is pretty dirty and finding the tape's end can be a challenge. The tape can be a real hassle to remove. The dog does not enjoy loosing hair and hide any more than I do removing it. There is an alternative provided by Steve Snell that uses duct tape. There is a short instruction tape on the Lewis boot page you should watch. I had not thought of applying the base layer of tape like Steve does. I have used his method several times, and it is perfect. No lost boots and the best protection available. Plus removing the boots is not painful and is a very easy and fast process. I use a bandage scissor a surgeon friend suggested that makes tape removal a breeze and is less susceptible to skin puncture. This scissor has a 'safety tip'. Well, enough of my rambling. Good luck and good hunting. "After proper attachment excellent boot and few are lost." Only problem with these boots is putting them on right following directions to wash before use and attaching boot to dog one tab at a time. After proper attachment excellent boot and few are lost. "After several training sessions and a few hunts, these boots have proven to be solid and reliable and should last several seasons." This is the first pair of boots purchased for my Brit. After researching many styles, I was concerned the velcro type attachments would result in a thrown (lost) boot in the middle of a long hunt. I also wanted a tough boot to withstand the sand burrs found in West Texas. Watching Steve's video on how to properly fit and attach the Lewis rubber boot was helpful, but it does take some practice and patience for both you and your dog. After several training sessions and a few hunts, these boots have proven to be solid and reliable and should last several seasons. "I think the Lewis boots are the best available." I think the Lewis boots are the best available. "These are the only boots you should consider." These are the only boots you should consider. Be sure to tape down the rear flap first (contrary to the video), so that if your dog wears through the tape at the front, the boot will flap off and still be secured to the leg. This tip was from ol' man Lewis himself, and has saved me a lost boot or two. Also, I have started using Gorilla brand duct tape. It is very thick, and stays stuck. "The only boots I will use!" The only boots I will use! "No more trips to vet after grass seeds and thorns cause infected toes." The first 5 minutes were a little comical w/ dog high stepping like a Clydesdale, then it went great. Didn't even do vet tape underneath and had no rub spots. No more trips to vet after grass seeds and thorns cause infected toes. "The boots are much better than any of the others we tried." The boots are much better than any of the others we tried. My dog has a hip issue, so she drags her back toes when I walk her. I would love to get the XXL though. She needs socks and is a tight fit. These are awesome! My dog doesn't even acknowledge that they are on his feet!!! A+!!!! Very fast shipment and communication as well!!! "They work in sharp limestone country." They work in sharp limestone country. "Boots worked great on the beach even with oyster shells everywhere which are like razors." For my 49lb GSP, I should have ordered the L not the XL is all. Boots worked great on the beach even with oyster shells everywhere which are like razors. Perfect solution. Tape correctly or you can lose a boot in the mud. First use my dog ran 12.5 miles broken down basalt terrain feet were perfect dog was beat. The only dog boots that work for dogs in Chukar country. Best dog boot on the market. Boots are excellent. They protect the dogs pads and keep us hunting all day. Easy to put on and take off. As a long time upland hunter, these are the only boots I will use. "The only boot that I have found that works in the AZ desert." The only boot that I have found that works in the AZ desert. We hunt on a lot of rock covered ground. They save his pads but are a little tough on the skin from rubbing. I have tried various methods to prevent this including baby socks and various athletic tapes. "Best boots for hunting the corn fields in Nebraska." Best boots for hunting the corn fields in Nebraska. "These boots really make the difference in rocky terrain or areas that have sand burrs." These boots really make the difference in rocky terrain or areas that have sand burrs. I can hunt my setters for multiple days using the Lewis boots. They take a little while to put on, but they are worth It! Boots worked awesome. I would recommend to anyone who's dog gets sore feet. Best boots I've found. Great recommendation. "After trying several different pairs of boots, I found these Lewis rubber boots to be the absolute best." After trying several different pairs of boots, I found these Lewis rubber boots to be the absolute best. I'll never use anything else. "These boots are incredible, easy to put on, and easy to get off." I have tried several different styles of boots and have been disappointed with all of them. These boots are incredible, easy to put on, and easy to get off. They do everything that the fancy ones with all the buckles, straps, Velcro, and zippers will do. I have finally found dog boots that are user friendly and effective. This is my 3rd set. My bird dogs run hard in the desert and a cut pad will really lay a dog out. Cut knuckles from grass in Montana is tough on a dog too. These boots prevent these injuries from happening. Burrs and cactus almost bounce off these boots. They're great! I love them! "Have used Lewis boots for years and pleased that Gun Dog carries great products." 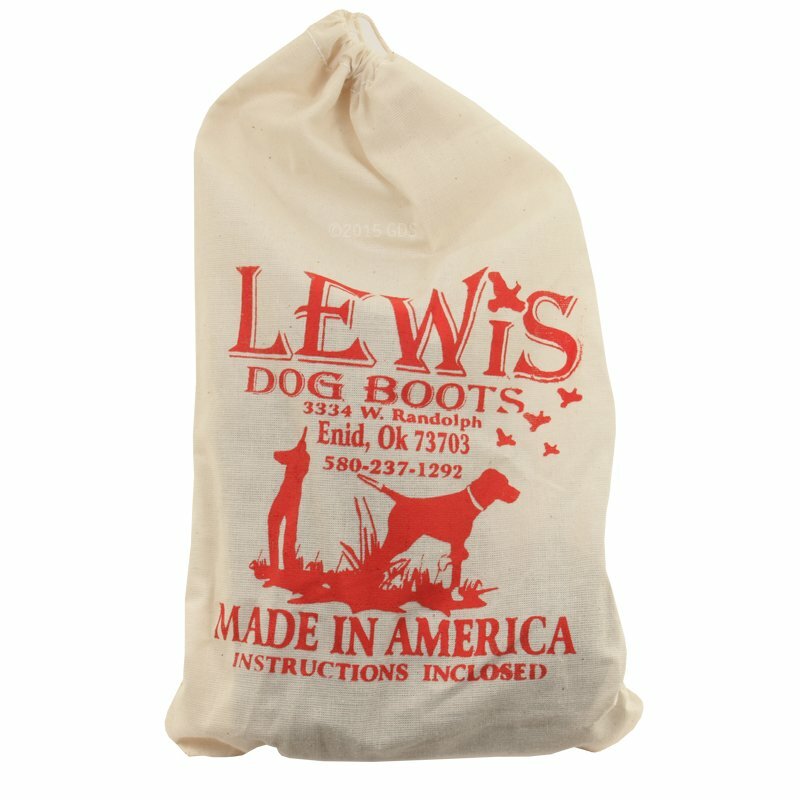 Have used Lewis boots for years and pleased that Gun Dog carries great products. "The boots work great and fit great." "The best for really tough conditions like southern AZ." The best for really tough conditions like southern AZ. Could be overkill for areas with just sandburrs, where something with a canvas top might retain as much heat. "Everybody we hunt with use these boots and say these are the best they have found." We haven't gotten to use the boots except in the yard. Dogs do not seem to mind them much. Everybody we hunt with use these boots and say these are the best they have found. Looking forward to using them. Great service from GUN DOG SUPPLY. I will be back. "I just tried another brand a couple of months ago, and they were shredded in about 45 minutes, so I went back to the good Lewis boots." "Best boots for Arizona. I have used them for many years now." Best boots for Arizona. I have used them for many years now, on departed hunting dogs. Shake some baby powder inside the boots for ease of installation. "Best boots made to protect hunting dog feet when hunting in sand burrs, puncture weed patches, or if cactus is a problem." Best boots made to protect hunting dog feet when hunting in sand burrs, puncture weed patches, or if cactus is a problem. Highly recommended. "They are great for protection against sand burrs"
They are great for protection against sand burrs, however, a bit of a challenge to put on an anxious, excited, ready to hunt dog. Great product from GDS as always!!! "We have grass burrs and mesquites, but while wearing their dog boots my two labs can hunt all day without any problems." I live in Southeast New Mexico. We have grass burrs and mesquites, but while wearing their dog boots my two labs can hunt all day without any problems. "Only walked funny for a few minutes, then acted like she'd had them forever." The boots went on easily, and she wore them all day. Only walked funny for a few minutes, then acted like she'd had them forever. We spent the day in rocky and cactus-filled fields, and not one single problem. Thanks for a great product! "Saves the dog's pads in the desert during quail hunting and saves the dog's knuckles from bleeding in the CRP grass during pheasant hunting." These boots are great! Aero, my Bourbonnais, is entering the 2nd season on these boots. She wears them and hunts hard in them. With proper installation, they are no hassle at all. Easy to see thorns, if they penetrate the rubber. Saves the dog's pads in the desert during quail hunting and saves the dog's knuckles from bleeding in the CRP grass during pheasant hunting. I definitely recommend these boots to anyone who want's their dogs to run longer and harder, simply because of the protection they offer the dog. If the dog has healthy feet, it'll never stop hunting. Excellent product. Hunt where there are lots of sand burrs, and with these on my dog Raven, she doesn't slow down to pick burrs out of her feet. "Wish I hadn't wasted money on so many other boots"
They're the best. Wish I hadn't wasted money on so many other boots that my dog ran through the soles in a week. Have had these since June, and my dog tows me two miles a day on my trike on pavement running 12 mph. They only now have torn, and the tread has worn off, which is an amazing amount of rough use. Easy to put on and take off, as I use Velcro for fasteners instead of going the tape route. Works well and we're both very happy with these boots! So glad I finally gave them a try. "Dog boots are just as expected. Plus great customer service." Dog boots are just as expected. Plus great customer service. Paid for basic ground shipping and got 2-day air instead. "The Lewis rubber boot is by far the best on market." I have hunting for 43 years and tried all kinds of foot protection on them. I live in Arizona and have hunted all kinds of game birds in an area that has all types of objects that harm a dogs foot. 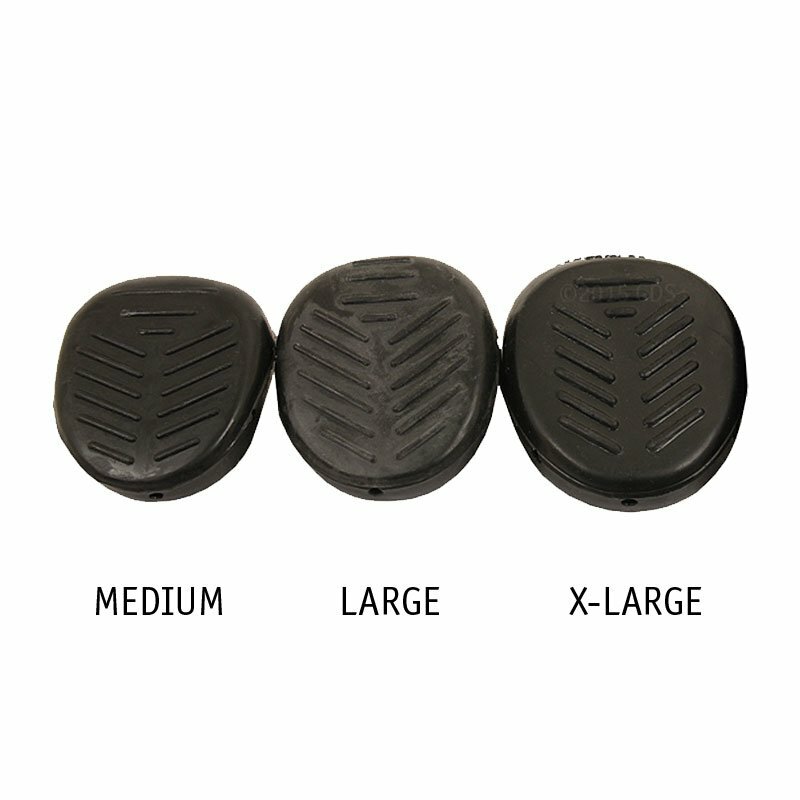 The Lewis rubber boot is by far the best on market. They take a little time to teach your dog to allow them to be put on, but some learn to love their boots. "If taped up properly with pre wrap and athletic tape, there will be no issues. Best boot around." If taped up properly with pre wrap and athletic tape, there will be no issues. Best boot around. Tried and lost them all. My dogs wear them to hunt chukars on the rocky desert terrain of Eastern Oregon. One 40 lb dog wears med the other 50 lb large. The sizing chart is correct. Keeps mean seeds like Cheatgrass out of the toes. "When properly fitted and care taken to put on, they are wonderful." Just ordered two sets of these boots for my young vizsla. When properly fitted and care taken to put on, they are wonderful. I use an initial vet tape wrap above the foot, where the "leg" of the boot will be. The rear flap of the boot may have to be trimmed, so as to not rub the protruding joint. Custom fit for your dog. A couple of wraps of duct tape will hold the boot on very securely. Leave enough vet wrap above the boot to apply the tape...not directly to the dog's leg. My dogs hunt quail in west Texas, and I have never lost a boot, but I have an extra set just in case. HINT, if you custom fit your boots, or if you have different sizes for front and rear feet, and with the boots not on the dog(! ), you might try using the hot tip of a soldering iron to brand each boot "front" or "rear", but be careful not to burn through the boot. "Best boots I've used from either commercially available sources or the various hand made options I've tried!" Best boots I've used from either commercially available sources or the various hand made options I've tried! "Have not used the boots yet, but I know they work well if I can keep them on his paws." Hunting season in Okla has not started. Sand burs are bad this year. Have not used the boots yet, but I know they work well if I can keep them on his paws. They work really well! We hike with our dog. Have been running Lewis boots on my dogs Quail hunting in the desert for 12 years. They are excellent. "These are the best boots I have used." These are the best boots I have used. I have 3 sets, and they work great. "Ran these on my Elhew last year without any problems." Ran these on my Elhew last year without any problems. Just follow Steve's instructions as how to put them on. Plan on trying Vet wrap as a underwrap this year to insure that there is no chaffing on leg. Bought another set for my Shorthair. Definitely worth the investment. I used the boots on my dog this last week hunting pheasant in Kansas. They worked great. We hunted a lot of CRP land with lots of stickers. My dog never slowed down. "The best dog boots I have used in really bad terrain." "The boots were easy to put on the dogs and they held up very well." GWP & Small Munsterlander. Hunts. This is the first time is used these type of dog boots. We were hunting desert quail in rocky terrain where there were lots of cactus. The boots were easy to put on the dogs and they held up very well. "Has made my dog a five day hunter in stead of a two day dog. " They sure help my dog and her tender feet. Has made my dog a five day hunter in stead of a two day dog. Feet would be for up without these Lewis boots. Great fit and instructional video for putting boots on. Dog got used to them within 5 minutes. We have had trainings with boots on, but not hunted a full day yet. Looking forward to seeing how she does. "They work great, and the dogs can run all day without loading their paws up with stickers." While I haven't used these on my dog, yet my good friend regularly uses them on his two dogs in sand burr-infested central Oklahoma. They work great, and the dogs can run all day without loading their paws up with stickers. "They protect from dog pad wear as advertised." My two brittany's wore these for a long hard day and a half in the canyon lands of eastern Oregon. I followed instructions for how to secure to dogs feet without cutting off circulation. At the end of the day they both had worn off fur and skin at the top of the boots. Next time I will use medical tape on the legs to act as a sock of sorts to rub points won't be as severe. Also, make sure to trim for proper height as the dogs feet will slide a lot and top of boot impacts the stopper at the rear of front leg. This will cause a wound. Otherwise, these are great boots and wear really well. They protect from dog pad wear as advertised. Haven't had a chance to use them yet, but I haven't heard anything bad about them. Great boots. I have found using athletic tape and flipping down back flap to run a couple rounds to dogs leg, then let flap up and complete taping works best for these boots staying on. If wet, I might finish w/ 1 loop of electrical or duct tape also. "Placing order online was very easy and was received quickly." Placing order online was very easy and was received quickly. "Labour intensive if hunting daily, but work well and stay on if the double taping system is applied." Labour intensive if hunting daily, but work well and stay on if the double taping system is applied. "They seem like they will hold up better and last longer than the nylon/leather boots I've had in the past." They seem like they will hold up better and last longer than the nylon/leather boots I've had in the past. Good solid product. Beats the "gimmick" ones with kevlar and other materials that don't last. Sure beats using duct tape in an emergency or making your own out of leather. Now if they would just make one that works in cactus life would be good. "Use the vet tape to wrap the legs, then put the boot on, then duck tape boot to wrap." Use the vet tape to wrap the legs, then put the boot on, then duck tape boot to wrap. "These boots protect the dogs feet well." These boots protect the dogs feet well. They are a bit of a pain to tape on, and if not done correctly will be lost. Best boots I've used. "Good quality and easy to use"
Great boots. Stops every cacti in California. Can be a little hard to get on. I use toddler socks to prevent any rub marks on her paws. Very good quality. Just little hard to put on. "Got a large size, but no way that design would ever fit that dog unfortunately, looks like fine quality boot though." Got a large size, but no way that design would ever fit that dog unfortunately, looks like fine quality boot though. Maybe I didn't put them on correctly, but out of three dogs I lost 8 boots before the morning was out. I wish there were some boots that came up higher on the leg that attach to more surface. "I don't think this is a poorly designed or inferior product." I don't think this is a poorly designed or inferior product. My dog refused to walk with these on. She seemed stressed when wearing them and laid there and chewed on the duct tape required to keep them on her feet. I tried walking her with them on, and after serious coaxing, she would walk with them on, but looked like a drunken sailor. I gave up using them because she was hell bent on getting them off and wouldn't leave them alone. She kept chewing on the duct tape. Some dogs might adjust better to them than mine did, so I'm on the fence as how to comment on these. "In the end I took them off." I put boots on her and hiked around park for an hour. She did fine. When we hunted through a boot in the first 30 min of hunting when crossing a fence, I saw it come off so got it back. 15 minutes later she lost another one, and I did not see it, so we lost that one. By end of hunt one of the rear boots had slid down and was riding between her outside toe, so had to remove it. In the end I took them off. I thought I had put them on correctly, but maybe they were too loose. I hunt in pretty heavy brush, and I couldn't get them to stay on my dogs feet. However, I can't find a boot that will stay on my dogs feet for any length of time. Could not keep them on. She keeps losing them. Protect your dog's feet from sand burrs, rocks, and brush, or protect an injured foot or sore pad. Lewis Dog Boots protect your dog's feet from sand burrs, rocks, and brush, and can also protect an injured foot or sore pad. These are the most durable boots we have seen to date. They are light, pliable, and very tough. 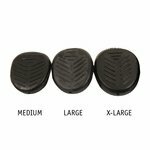 Lewis Boots are made of tire tread rubber with a tread on the sole to increase the life of the boot and for non-slip traction. Secure Lewis Dog Boots to your dog's feet with waterproof adhesive tape. Set of 4. Instructions included. We recommend a vented dog boot except in snow and ice. 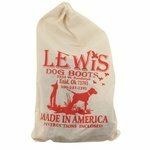 Click here for Unvented Lewis Dog Boots. Measure from the back of the dog's heel (pad) to the end of the longest toenail. Measure both the front and back feet as they sometimes vary and use the larger measurement of the two.